Exclusive handmade Christmas decoration items for this Christmas season. Metal Hanging Heart For Christmas Gifts, Size: 6"
New Design Hanging Heart For Christmas Decoration, Size: 6"
We hold expertise in manufacturing, exporting and supplying a wide range of Christmas Decor in the national as well as international market. Our offered products are manufactured and developed at our production unit by using superior quality components and ultra-modern technology in tune with industry set norms and guidelines. We are leading manufacturer and supplier of christmas hanging and other christmas decorative items in metal like aluminum, iron, steel etc. The same design of hanging heart is of aluminum metal with white powder coating, the same design also come in polish finish. Put a touch of romance in your Christmas with these papier-maché Christmas Tree Hearts. Available in different Sizes & Designs. 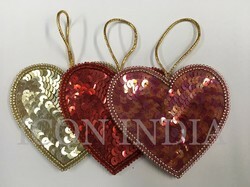 Our company is the major company known for providing Christmas Heart for decorations to the clients. We manufacture and export stunning home décor products, metal handicrafts and kitchen accessories with the unique fusion of traditional and modern art. Our collection of Christmas Decoration items includes a variety of handmade products. Crafted solely from quality metal, each art piece of the collection is not only striking but also durable.